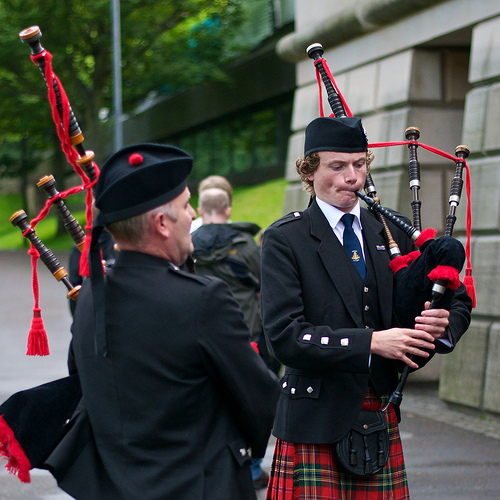 Music Costs > How Much Do Bagpipes Cost? How Much Do Bagpipes Cost? Most of the time, bagpipes won’t be found at your local music store; instead, these musical instruments will have to be purchased either online or at a local specialty Scottish store. The cost of bagpipes will greatly depend on the materials it’s made from, the ornamentation, engraving, overall design, manufacturer and where you purchase them. Henderson’s states Polypenco plastic pipes can cost about $650 to $1,100, depending on the ornamentation and engraving, while a new, higher quality set of blackwood pipes can cost $1,000 to $6,000, again depending on the ornamentation and engraving. Hand-engraved silver and gold could add much more to the costs. Stanford University says a set of good quality pipes can be had for about $1,300 brand new. In this detailed guide on CCBagPiper.com, he states that, even if you were to buy used, a good quality set will cost $500 to $1,000. Bagpipes are often made from African blackwood and other related tonewoods such as cocobolo, Mopani, rosewood, cocuswood and boxwood. The most common type, African blackwood, is most preferred due to its unique qualities, which produce a greater-than-average tone. It tends to be more expensive due to its maturity, availability and seasoning time, according to Lyons Bagpipes. The bagpipe, when purchased, will be made up of many different parts, mainly the drones, blowpipe, the pipe chanter and the bag. When purchasing new, you can often add customizations such as engraving the mouthpiece, chanter bowl or ferrule. Engraving can cost about $40 to $75 per item. Bagpipe accessories to consider can include the pipe bag, mouthpiece, blowpipe valve, pipe cords and/or the pipe bag cover. Some of these accessories may come included with your purchase, while other pipers often want to upgrade these parts for a better experience. A pipe bag case is often recommended to purchase your instrument when not in use. A good case can cost $100 to $250. A maintenance kit, another accessory highly recommended, can include bore tape, Teflon tape, drone and stock stoppers, and pull through swabs. A good maintenance kit can cost $30 to $50. Because African Blackwood is now on the CITES Endangered Species List, import and export charges may apply, depending on who you’re purchasing from. Be prepared to budget for lessons if you were new to the instrument. Henderson’s, the retailer we mentioned earlier, mentions you should steer clear of any bagpipes less than a few hundred dollars. These bagpipes are often designed for ornamental purposes and will be lower in quality, making it hard to produce the correct tone. Popular bagpipe manufacturers in the United States include Gibson and Dunbar. Unless you really know what you’re doing, it’s highly advised you don’t purchase a set of used bagpipes on eBay. Those who are new to the instrument will actually learn from what’s called a practice chanter. So, until you master this, you should save your money until you feel comfortable with your practice piece. A good practice chanter, with instructions, can cost less than $40.